After more than half a century at the bottom of the Pacific Ocean, a World War II-era aircraft carrier potentially containing one hundred barrels of nuclear waste has been rediscovered by scientists. The United States National Oceanic and Atmospheric Administration said Thursday that it has once again located the USS Independence. Scientists sunk the carrier in 1951 off the California coast after using it for atomic tests, and now thanks to help from the Navy and Boeing they’ve been able to determine the exact spot where it rests today. A camera-equipped and remotely controlled underwater submarine was used by NOAA to examine the scene and determine that they had in fact found the right carrier. During the Second World War, the Independence saw combat at the Battled of Tarawa, Cape Engano and Wake Island, and at one point had was seriously damaged by Japanese torpedo planes but reentered into service nevertheless. Once the war was over, the Independence was used to gauge the effects of atomic bomb tests at Bikini Atoll; during two historic tests undertaken in the Pacific, the carrier sat in the ocean within sight of ground zero. 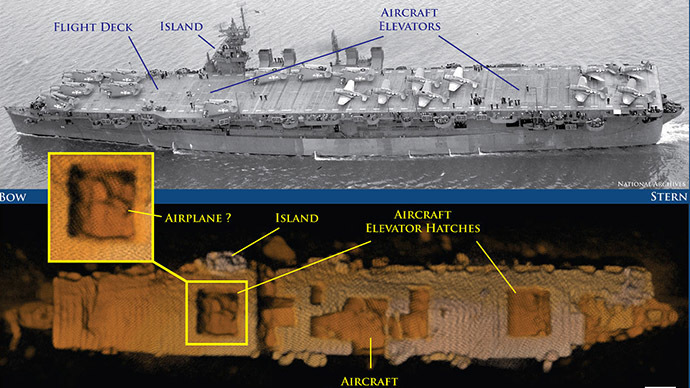 “The USS Independence, like dozens of ships involved in Operation Crossroads, was damaged by the shock waves, heat and radiation from the tests and ultimately was sent back to US Waters,” Live Science reported this week. Until 1951, that is, when the Navy dragged it from the California coast and let it sink. Today, scientists say the ship is around 2,600 feet below the ocean surface. According to Delgado, drums of radioactive material are buried within the ship – potentially upwards of 100. The San Jose Mercury news reported that the barrels of waste were filled with concrete and sealed deep inside the ship behind thick brick walls, and experts say they don’t think there’s any cause for concern.